Exclusive from Rohit Aroskar..know your city ( Mumbai) weather better..
Past 18 year averages of Mumbai (western suburbs)..
On Sunday see an upper air trough forming East-West along the North Maharashtra region. An UAC may form embedded in the trough on Tuesday. Akola may see moderately heavy rains on Monday and Tuesday. Aurangabad got 32 mms on Sunday evening, and showers may continue for 2 more days in the evenings. 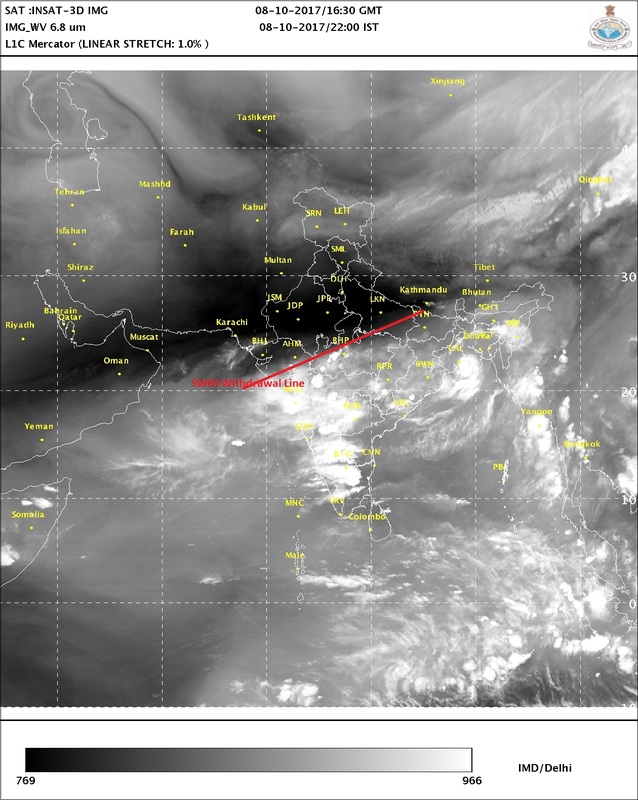 As the system moves West, Rains likely in Surat and Valsad on Tuesday and Wednesday. Mumbai: Thunder showers lashed Mumbai on Friday , Saturday and Sunday. Sunday Mulund and Thane regions saw the heaviest rains with Thane measuring 53 mms till .30 pm and Mulund (Mumbai) measuring 47 mms. Monday/Tuesday: Partly cloudy and sunny days. Thunder clouds developing may precipitate light to moderate rains in some parts of Mumbai City. Rains will be less than the rains experienced in the weekend in Mumbai. Rains may increase on Wednesday 11th. Pune: Monday will see the skies getting cloudy post noon. A thunder shower likely in some parts. Tuesday will see a heavier thunder shower in Pune and surrounding areas. Kolkata: 3/4 days more...Showers to continue till Thursday. Looks like again MAHA is in middle of monsoon like july/august! Rains needs to end to allow NEM to set? otherwise never ending SWM - duration is increasing every passing year. IMD forecast heavy rains for MAHA. When will SW Monsoon withdrawal from East M.P ? Will newly formed Depression give some rain to jabalpur ? Salim: Vagaries did not think or consider much of this system...and did not mention it,nor number it. On 9th at 5.30 pm when it was declared as a DD, it as at 1002/1004 mb ! System will fizzle out in next 24 hrs. For Jabalpur Not much rain, except a few showers , not very widespread, on Tuesday. 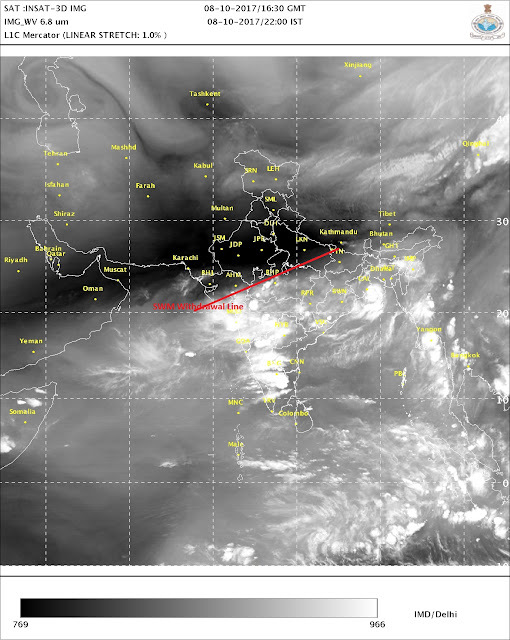 Waiting for this low to fizzle out, and then we see Monsoon withdrawal proceed Southwards from line shown. Low has formed over Marathwada /Madhya Mah. rajesh sir - could we have some rain totals from these unseasonal rains. Hope the dams in marathwada fill to the brim. Novrain till now in santacruz but. Read in newspaper that uran close to navi mumbai got black rain on weekend. This could be due to fire at butcher island. The El Niño–Southern Oscillation (ENSO) remains neutral. The surface of the tropical Pacific Ocean has warmed over the past fortnight as a result of weakened trade winds. This has reversed the cooling trend that had been observed since mid-winter. While sea surface temperatures remain well within the neutral range, anomalously cool water persists below the surface. International climate models surveyed by the Bureau suggest this recent surface warming may only be temporary, with further cooling of the tropical Pacific Ocean likely. Five of the eight models suggest sea surface temperatures will reach La Niña thresholds by December 2017, but only three maintain values for long enough to be classified as a La Niña event. While unusual, it is not unheard of to see La Niña develop this late in the year. Of the late-developing La Niña events, their effect on summer rainfall has been mixed, with some leading to widespread above-average falls across eastern Australia, and others having minimal effect. The current 3-month rainfall outlook suggests only a 50% likelihood of wetter conditions in many parts of the country. The Indian Ocean Dipole (IOD) remains neutral. Three of the six climate models surveyed suggest positive IOD thresholds may be reached during spring, but these positive values would be short-lived as IOD events naturally decay by December. Very light rain in santacruz..